I dreamt of dogs again last night. I thumbed through newspaper listings looking for blurbs advertising Boston Terrier litters. I called strangers to ask if any pups were left as I was looking for the perfect companion (or maybe two) for my ever-faithful furry four-legged friend. I pondered Shakespeare. Memories raced back into view. How the Royal Shakespeare Company production of Hamlet (with Mark Rylance in the role of the prince of darkness) dazzled me on the banks of the river Avon. To see it there in such an eloquent setting not far from the historic home of The Bard himself surely elevated the experience. The privilege and significance might have easily been lost on that younger version of me, had the play been simply a mere performance on that dazzling night of nights. Instead, it saturated me with a nagging vengeance worthy of the tortured prince. I watched from above, to the right of the stage, (seemingly suspended in air), hovering over the proceedings as if catching it all from the vantage point of a ghost. (Maybe I was the ghost of King Hamlet.) The pained contemplation and confusion of our tragic hero was so gripping that time became nothing more than the isolation of a pin-drop moment. Now, I think of Edgar Sawtelle and how he reminds me of more than just Hamlet. Huck Finn comes to mind. These are larger than life characters that live beyond the confines of time, space, and print. They are the unforgettable. I dreamt of dogs again last night. My first mutt, Gravy was flying round the yard in a game of chase that is still going on—round and round and round—tracing the outline of a heavy, nostalgic heart. I thought of Banks, the angelic Boston Terrier who waited for my return each day with a joyful anticipation that wiped away sour moods quicker than a swift lick to the cheek. The power is not confined to the moment upon which the door opened. A waiting dog lives inside us throughout the day, on the El ride home, as we walk up the stairs, sit in a meeting, drive our cars. They are there. They never leave, akin to the Edgar Sawtelles, Hamlets, Huck Finns, and Holden Caulfields, the rich characters and their stories that refuse to live on a nightstand, locked within spines on a shelf. The book was finished but I couldn’t leave. It was part of me now. I thought of Almondine and of all of the dogs. I thought of the towering Sawtelle barn, more vivid than a fictional component has any real right to ever be. I thought of my own childhood home at 100 S. Central Ave., equally as epic no matter how small it looks as I drive by it today. And so it is, when you are locked in a time and place, as Elvis once sang, caught in a trance. So it is with the unforgettable places, people, characters, and memories. They are all part of the mass accumulation that inhabits our heavy, overflowing trunks—trunks that are too heavy to carry but simply impossible to leave behind. 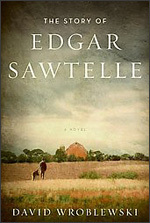 Days and years will pass and I will think of Edgar Sawtelle again—where I was, back then, when I was reading his life story, who I was, who I am now. And I wonder with great anticipation, what next great artifact will finds its way into the trunk.